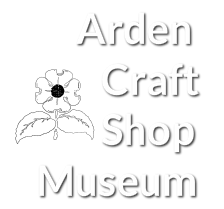 Did you know that there are many creative ways for you to support the Arden Craft Shop Museum? You can leave your legacy for keeping and maintaining the long history of our villages: Arden, Ardentown, and Ardencroft. With thoughtful planning, planned gifts can benefit both you and the Arden Craft Shop Museum, Inc.
Make a charitable bequest to the Arden Craft Shop Museum, Inc. in your will. Make a gift of appreciated stock to the Arden Craft Shop Museum, Inc.
Another easy way is to name the Arden Craft Shop Museum, Inc. as a beneficiary for your retirement plan. Celebrate an occasion, honor or remember someone with a gift in their memory to the Arden Craft Shop Museum, Inc. The benefit of making “Legacy Gifts” is the satisfaction of knowing your money is going to a cause that is important to you. Leaving a gift to the Arden Craft Shop Museum, Inc. will ensure your legacy (of support) will live on for years to come. With thoughtful planning, "planned (legacy) gifts" can benefit both you and the Arden Craft Shop Museum, Inc. You will be recognized for your planned gifts to the museum as a member of the Joseph Fels Legacy Society. The benefit of making “Legacy Gifts” is the satisfaction of knowing your gift is going a cause that is important to you and that it will give the museum and archives the resources needed to keep the Arden Craft Shop Museum, Inc. functioning for generations to come. By letting the Arden Craft Shop Museum, Inc. know about your bequest and “planned gifts” to the Arden Craft Shop Museum, Inc. you will be recognized as a member of the Joseph Fels Legacy Society. You will receive a certificate for your membership along with a Joseph Fels Legacy Society commemorative pin and special invitations to our museum events. Joseph Fels (1853–1914) was a wealthy, American soap manufacturer and philanthropist. Fels was a supporter of Henry George and his proposed land value tax. Fels funded the Georgist colony of Arden, Delaware, in 1900, founded by architect William Lightfoot Price and sculptor G. Frank Stephens. He financed several Will Price designed permanent cottages for the Arden community. The “Fels Oak” tree was planted in 1914 on the Arden Village Green as a memorial to him for his generous support. The purpose of this page is to provide information of general character only; the Arden Craft Shop Museum, Inc. is not engaged in rendering legal or tax advisory service. Advice from legal and tax counsel should be sought when considering these types of gifts.